Not much money in it, however. Allergan has raised prices continuously through the last 14 years. The middle (us) is getting squeezed. There are not many discounts available, even to the larger practices. Yes, discounts on fillers, no to neurotoxins. The prices are so competitive in our market it makes it not worth competing. Some people import from Canada (illegal, and yes you can go to jail!) We could do this until July 2017 when it was cut off. Integrative Medicine - is it legal? I work with a PA. We get along just fine. I believe it depends on the person. We are both older and work well with all members of our team. Never an issue (as it should be!). 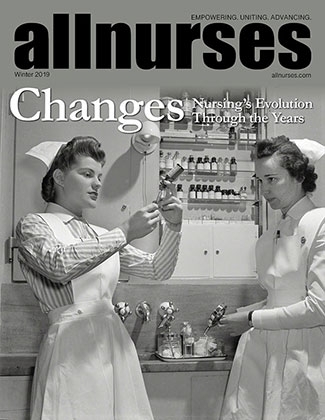 Nursing has changed significantly in the last 10 years. I am not going to dissuade you from entering the field but all the feel goods that I used to have have dissipated. I also left the corporate business world. It is nothing but a money game today. Sad times. Will marijuana ever be okay in nursing? I wonder what will happen when GW Pharmaceuticals Epidiolex hits the market 6-8 weeks out. It is 98% CBD, 1% thc and !% other fillers including flavorings. It is for seizures and migraine headaches. The DEA rescheduled the thc from schedule 1 to schedule 5 on 9/29/18 for this one pharmaceutical company. That said, I would imagine that someone on this medicine would test positive on a random drug test. Thoughts? I do not, nor will take the medicine but I know some will need it. I might also add that the investor website says the price will be 32k per year for a 12 month prescription. Kratom is going illegal in many states. I look for it soon to be added to a drug panel test. I think we are months away from it. Georgia will decide in January whether or not to add to schedule 1. Six other states have already done this. Ohio is close to schedule 1 as well. Spent the weekend with a MD in my group. Her pay has declined significantly since so many NP's are hitting the market. She makes $125,000 per year. Sounds like a lot right? This lady has 200k plus in student loans and works extra shifts to pay off her debt. She said I should be just as angry as my career choice is decimating right in front of my eyes. She expects to somewhat in the future be replaced by a NP that will work for 75k at least that is what she hears in her hospital (we are all in the SE, so wages are naturally lower). I do not believe it to be worth dropping 100-200k on a NP degree nor 200-500k on a MD degree. Those days are long over. The docs and NP's at my conference are all going to cash practices. I am doing the same. $65 for a walk in visit. I have to pay rent and everything else on top of this. This career choice was good for a time but pay is declining significantly. RN's making more (most likely in the north and western US). One of the docs I worked with in the past told me that poppy seeds can lead to a positive marijuana urine test. I had never heard this before. I quit buying poppy seed buns at the market. I am thankful for my health (mental and physical). I am thankful that I do not suffer any tremendous hardship in my life. I am thankful for the many wonderful patients that I serve. Also the fact that I still have my father in my life (he is 88). Not going to happen. GW Pharmaceuticals is bringing to market a new drug called Epidiolex in 6 to 8 weeks. It is 98% CBD, 1% THC and 1% other fillers. DEA rescheduled marijuana September 28,2018 for this one drug company. Rescheduled from 1 to 5. Again, only for this one drug company. The drug is being brought to market for migraines. The drug will cost 32k per year for a RX per the investor website. Medicaid is going to cover but I am not sure what percentage a patient will be responsible for. Maybe someone else can find out. Lobbying is too great. NEVER will the USA will this be federally legalized. The pharmaceutical companies are far ahead in this with research. I personally believe that no more states will need to allow medical marijuana. You will go to your provider, get a rx and go to the drug store to fill. End of story. It is going on everywhere in my state. I recently went in to get botox at a clinic. I assumed (never assume) that the person giving me botox was a Nurse Practitioner as they said the doctor was not in. SHE WAS NOT EVEN LICENSED. Not an MA. Not a plebotomist. Not a LPN or RN. She was hired off the streets. This is becoming a trend I believe. Business degree person realizes there is money to be made in medical and hires non licensed staff to do procedures. Business person makes way more money because wages are lower. You can call the BON. All the business will do is reopen under another name. That is what they do here. These are typically "med spas". Actually Kratom is illegal in many states. You can go to jail for it in Alabama. Many states are following this as well....i.e Indiana, Tennessee, Kentucky among others. I fully expect it will be federally illegal very soon. There is nothing easy in life. It is best that you learn this now. Academic adviser says I'm selling myself short by going into nursing. Maybe she equates nursing with being a candy striper. I am a NP in private practice. When I attend social events, some think all I do is fluff pillows. Generally these are older people. That said I am in my 50's. Is your adviser an older person? Perhaps, that is what he/she equates nursing with.